Our Edibles are Infused in house, we take expertly crafted candies and then coat them in our triple refined High grade Distillate. you will feel the effect without the taste of cannabis. we only provide clean and potent medicine. FRESH BAKED GOODS, DRINKS, DRESSINGS, CANDIES AND SOO MUCH MORE!!! Available in 100 MG Packages! 4 Gummy Bananas, coated in sugar, packed with Crazy Banana Flavor! 4 individual Belts, Coated in sugar, Blasted with mouth watering Blue Raspberry Flavor! 4 gummy Cola Bottles, Coated in sugar, Blasted with mouth watering Blue Raspberry Flavor! 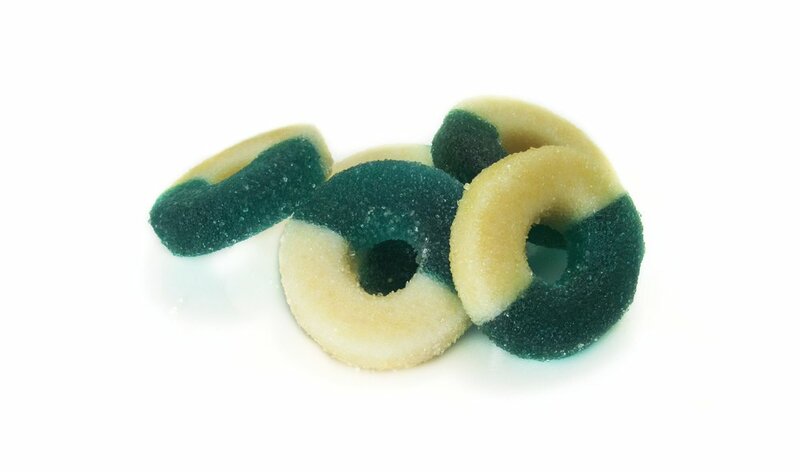 4 Gummy Rings, Coated in sugar, Blasted with mouth watering Blue Raspberry Flavor! 4 Gummy Cola Bottles, Coated in sugar, bursting in Cherry Cola flavor! 10 bite sized, delicious cherry flavored drops! 4 Rings, Coated in sugar, popping with mouth watering Cherry Flavor! 4 Sour Rainbow, sugar coated belts!